The second day of the NFL Scouting Combine featured a lot of big names, and quite a few guys that made a big impact. Quarterback-wise, it’s still clearly a two-horse race between Jameis Winston and Marcus Mariota. Brett Hundley and Bryce Petty each had solid days, and which quarterback goes #3 is going to come down to personal preference. Both of them are going to need work before they can start in the NFL. Overall, it’s a weak quarterback class. Jameis Winston, QB, FSU: Very calm, charismatic and entertaining all day. He posted a very slow 40-time, but that was to be expected. Winston isn’t an athlete, he’s a pocket passer. His footwork looked smooth and he dropped dimes all over the field to wide receivers all day. As long as he answers the off-the-field questions for Tampa Bay in a manner they deem acceptable, I think he’s a lock for #1. Marcus Mariota, QB, Oregon: Mariota has apparently done phenomenal in interviews with teams this week and his on-field performance matched that. He looked very smooth with his footwork dropping back and made all of the throws. I personally don’t doubt his ability and think he’s going to be a stud, and I’m sure teams and other people will start getting on board now. 40-times don’t impact quarterback evaluations, but a 4.52 40 is still very impressive. I think that Winston is the best quarterback in this draft, despite Mariota being the better athlete (which wasn’t a surprise). The running backs proved to be far less athletic than I’m sure people had hoped, but it’s still an extremely deep class. Slower 40-yard dash times does not change what this group has done on the field. I think the two biggest benefactors of the day though were MSU RB Jeremy Langford and Northern Iowa RB David Johnson. Langford had the fastest time in the draft and certainly answered any questions about his speed. Ameer Abdullah, RB, Nebraska: Only posted a 4.60 40-yard dash, which was surprising considering he has a 42.5″ vertical leap. He also posted 24 reps on the bench, which was extremely impressive. Quite frankly, the only questions Abdullah has to answer can’t be answered at the Combine. His biggest weaknesses are his pass protection and the fact that he fumbles the ball an awful lot. Jay Ajayi, RB, Boise State: Ajayi posted a 4.57 40-time, which is right in line with his tape. Add in the fact that he’s 5’11” 221 lbs and posted 19 reps on the bench and he’s going to be a problem to bring down in the NFL. He’s not a game-breaker, but he’s got a chance to be a very productive back. David Cobb, RB, Minnesota: Cobb pulled up lame on his first 40-yard dash with a quad injury and that knocked him out for the rest of the day. Any player in the Big Ten will tell you just how hard Cobb is to bring down, and he had a great week at the Senior Bowl, but he wasn’t able to separate himself from the pack with the injury and that doesn’t help him. Tevin Coleman, RB, Indiana: Coleman unfortunately had surgery on a toe injury that prevented him from working out at the Combine, and it’s unclear if he will be ready for Indiana’s Pro Day. Fortunately for him, he has some good film, but he lost a chance to boost his stock. Todd Gurley, RB, Georgia: Didn’t participate because he’s coming off of ACL surgery. Still the #1 running back in the draft, but it will be interesting to see how he progresses in his rehab. I’m guessing he’ll go late first round at best and won’t have a huge impact as a rookie. Melvin Gordon, RB, Wisconsin: Not much left to say about Melvin Gordon. He checked off the boxes with a 4.52 40-yard dash time and catching the football; and his film really speaks for itself. He’s the clearcut #2 running back behind Todd Gurley. David Johnson, RB, NIU: Johnson is a riser up the draft boards this offseason. His Senior Bowl performance turned some heads and he had a good day at the Combine. A 4.50 40 at 6′ 224 lbs with 25 reps on the bench and a 41.5″ vertical is pretty impressive. He may not have looked smooth running in tight spaces, but he did a good job catching the football. 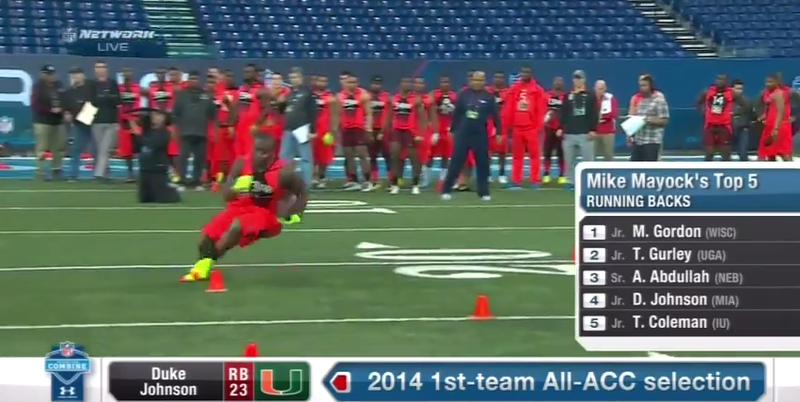 Duke Johnson, RB, The U: Only ran a 4.54 40-yard dash time, which was a bit disappointing. But it doesn’t make me love him any less. I desperately want him on the Lions. He does a great job catching the football and if you watch the video below, he’s got some sweet feet. He could probably lose a tackler in a phone booth. Like De’Anthony Thomas, his football speed is going to be better than his Combine speed. Jeremy Langford, RB, MSU: Probably the biggest winner of the running backs at the NFL Combine. Langford was the fastest running back of the day with a 4.42 40-yard dash time and that’s going to answer any questions any one had about his speed. This won’t vault him into the first two rounds of the draft, but he’s definitely moving up. Tyler Varga, RB, Yale: Varga had himself a fantastic week at the Senior Bowl, earning an invite to the Combine, but a bone spur in his ankle prevented him from working out. He’ll be healthy for his Pro Day, but you have to feel bad for a kid who wasn’t able to capitalize on his opportunity because of an injury. The wide receiver group is where the real money was made for some guys. ASU WR Jaelen Strong proved to have superior athletic talent than most thought, and WVU WR Kevin White blew everyone away when he posted a 4.35 40 time. UGA WR Chris Conley will also force teams to go back and look at his tape after he had arguably the best workout of any of the receivers at the Combine. Kenny Bell, WR, Nebraska: Outside of the three players mentioned above, Kenny Bell was one of the biggest winners of the day. Bell looked smooth catching the football and showed that he has some sneaky athleticism. He posted a 4.42 40-yard dash with a 41.5″ vertical and a 10’9″ broad jump. Definitely going to move up draft boards after today. Sammie Coates, WR, Auburn: Checked all the boxes for his physical talents, but did nothing to quell concerns about his ability to run the full route tree or catch passes consistently. He posted a 4.43 40 with 23 reps on the bench, a 41″ vertical and a 10’11” broad jump. An explosive athlete but in need of some work as a pass catcher. Chris Conley, WR, Georgia: As I said earlier, probably the biggest winner of the entire day. He posted a 4.35 40 with 18 reps on the bench, a 45″ vertical and a 11’7″ broad jump; all of which are totally absurd. This was most definitely not expected from Conley and he is going to fly up draft boards. He may have had around 5 drops in drills, but you cannot teach his athleticism. Amari Cooper, WR, Alabama: Amari is my #1 wide receiver in the Draft (though it’s really 1A, 1B with Kevin White) and he solidified that today with his 40-time. It was uncertain how fast he would be, but he exceeded expectations with a 4.42 40-yard dash. He may not have an explosive lower body (33″ vertical and 10′ broad jump) but he’s more polished than anyone as a route runner and has the best hands. Phillip Dorsett, WR, The U: Dorsett started to move the needle when he showed up to the Senior Bowl and he kept the momentum going at the Combine. 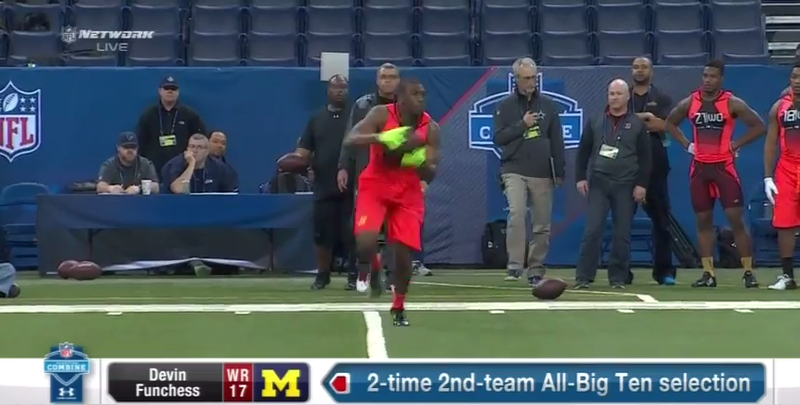 He’s a little guy (5’9″ 185 lbs) but he posted a 4.33 40 with a 37″ vertical and a 10’2″ broad jump. Dorsett looked very polished and sure-handed during drills and is going to make for a nice slot receiver in the NFL. Devin Funchess, WR, Michigan: I hate to say it, but Funchess probably hurt himself the most of any of the wide receivers. I personally think that Funchess will still go in the first round, but posting a 4.70 40 did not help evaluators pick a position for him. He’s likely going to end as tight end now, but he certainly can’t be an in-line tight end. He did post 17 reps on the bench with a 38.5″ vertical and a 10’2″ broad jump, but then he dropped around 4 passes during the drills. He’s got some work to do, that’s for sure. Also, he claimed to have run a hand timed 40-yard dash of 4.33 last summer, and I’d like to know how early that clock was stopped. Dorial Green-Beckham, WR, Missouri/Oklahoma: DGB is one of the more controversial prospects in the draft. He’s got great hands and his absolutely massive. He posted a 4.49 40 time, which is impressive at 6’5″ 237 lbs. But then he only had a 33.5″ vertical and a 9’11” broad jump, raising questions as to whether or not he’s worked out in the last year. He is a specimen with talent, but add in the off-the-field issues and I still don’t see how you can pick him in the first round when he hasn’t played in a year and didn’t blow people away today. DeVante Parker, WR, Louisville: A very efficient day for one of the top 5 receivers in the draft. He ran faster than expected with a 4.45 40 and posted 17 reps on the bench, a 36.5″ vertical and a 10’5″ broad jump. He’s not known for being an athletic specimen and that’s why these numbers are very good for him. Jaelen Strong, WR, ASU: Strong has a massive catch radius when you factor in that he is 6’2″ with a 42″ vertical and a 10’3″ broad jump. He wowed evaluators with a 4.44 40 and did well running the route tree. Has definitely moved into the first round after today. 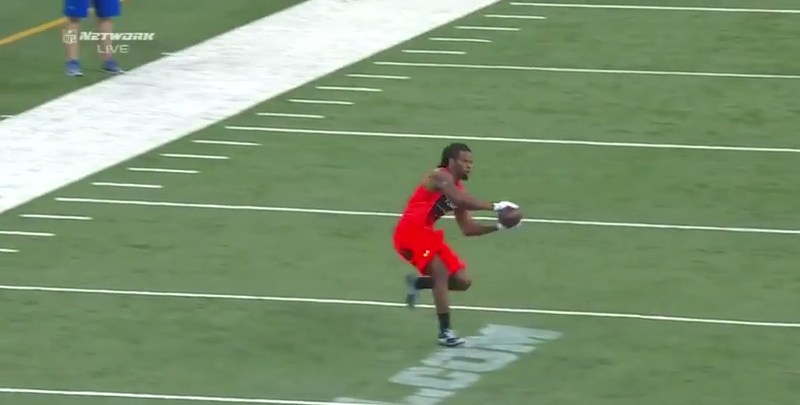 Kevin White, WR, West Virginia: White made bank today. He had a plethora of ridiculous catches during the season, and then he came to the Combine and posted a 4.35 40 time. While his 36.5″ vertical and 9’10” broad jump aren’t stand out numbers, he posted 23 reps on the bench. A strong and fast wide receiver at 6’2″ 215 lbs has pretty much assured the fact that he will go in the top 10 in the Draft. Now I could be here all day talking about running backs and wide receivers that helped themselves or hurt themselves. So rather than waste time doing that, I picked ten guys to mention from each position. Below, you’ll find a list of players who helped themselves with some notable performances as well. Tyler Lockett, WR, Kansas State: Personal favorite of mine, you might remember him from when Kansas State destroyed Michigan in the Buffalo Wild Wings bowl. Pure slot WR. J.J. Nelson, WR, UAB: The fastest WR of the day with a 4.28 40 and did a great job catching the ball all day. Unfortunately he’s only 156 lbs. Likely only a KR in the NFL unless he can put on some weight. Seriously, there were a ton of wide receivers that had good days on Saturday. This class may not be as deep as last year, but it’s damn close. I wouldn’t be surprised to see 5 or 6 wide receivers go in the first round this year. This entry was posted in NFL and tagged 2015 NFL Scouting Combine, Amari Cooper, Ameer Abdullah, Antwan Goodley, Chris Conley, David Cobb, David Johnson, DeVante Parker, Devin Funchess, Devin Smith, Dorial Green-Beckham, Duke Johnson, J.J. Nelson, Jaelen Strong, Jameis Winston, Javorius Allen, Jay Ajayi, Jeremy Langford, Karlos Williams, Kenny Bell, Kevin White, Marcus Mariota, Melvin Gordon, Nelson Agholor, Phillip Dorsett, Sammie Coates, Scouting Combine Day 2 Recap, Stefon Diggs, Tevin Coleman, TJ Yeldon, Tre McBride, Trey Williams, Tyler Lockett, Tyler Varga. Bookmark the permalink.